2003 L.A. Calendar Show coverage premiered on Tuesday, September 9th. It will re-air on Tuesday, October 28th 2003 at 10:00pm ET. Miss Los Angeles and top finalist on ABC TV's All America Girl! Click to visit the Beu Sister's website and see their music video! Our Featured Show Band The hottest sounding, most beautiful new girl group in the World in their first West Coast appearance, premiering their new album "DECISIONS." Meet Our Calendar Angels! Miss Minnesota Janelle Perzina, Star Search Spokesmodel winner Joanna Krupa, and The Man Show's Chandi Mason. Both days win cash prizes and a FastDates.com Calendar shoot! offered our spectators . . . Fans got to meet Chandi and our other FastDates.com Calendar Girls at the premier of our 2004 Calendars! Behind is the Queen Mary, the Catalina Island Express and a ferry boat from downtown Long Beach. Another sellout success for America's premier streetbike show! 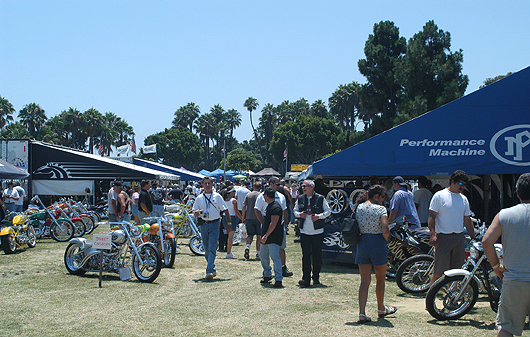 Long Beach CA, July 21st & 22nd, 2003: The 2003 edition of the Performance Machine presents The Los Angeles Calendar Motorcycle Show, sponsored by Iron Works magazine, Corona Extra Beer, Russ Brown attorney, Bikernet.com, FastDates.com, The ReCycler/Cycle Buys/LA Times newspapers, Trader Publications and Quick Throttle saw the continued growth of America’s premier outdoor custom and high performance streetbike event. 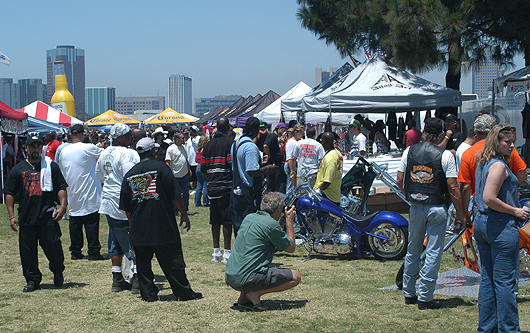 Produced by Gianatsis Design which also produces the popular FastDates.com website and motorcycle pinup calendars, this year’s event at the beautiful Queen Mary Event Park and facility in Long Beach saw the Show to be another sellout success as it was packed to capacity both days for exhibitors and spectators. A very happy Jesse Rooke, our Performance Machine Best of Show Winner with his retro Roadmaster bicycle styled custom "Rockett", surounded by the beautiful and talented Beu Sisters and FastDates.com Calendar girls Miss Great Britain Nicki Lane and Chandi Mason. Exhibitor participation for the Show was a sell-out weeks in advance at 140 Exhibitors and included a balanced mix of major motorcycle manufacturers including Titan and American Iron Horse, plus premier component manufacturers and distributors including show sponsors Performance Machine, together with Drag Specialties, Jim’s Machine, Edelbrock, Jardine, Pro One and many others. The top custom bike builders and race teams in America included Ron Sims, Paul Yaffe, Harold Pontarelli, Chica Custom Choppers, Mike Powers, MGS Customs and many others, plus the AMA National Supersport Roadracing Championship team of Corona Extra Suzuki sponsored by FastDates.com. Select boutique apparel companies included Feelin’ Lucky which produced the LA Calendar Bike Show’s official event shirt, plus Tribe leather and She Devil women’s apparel to keep the girlfrind’s occupied while the boys played with their big toys. The LA Calendar Bike Show offered fans 2-days of non stop entertainment that included the exciting new Jardine West Coast Horsepower Dyno Shootout run by Jardine Marketing Director Kerry Bryant which was jam packed with bikes roaring at full throttle and with hundreds of spectators all weekend. Plus there was Sunday’s Bike Show Contest for Customs, Sportbikes and Vintage Bikes. Performing throughout the weekend were two incredible live bands. The Show's featured act was the world's premier new pop vocal group The Beu Sisters (TheBeuSisters.com), four beautiful sisters -Danielle, Candice, Jilaine and Christine- flown in from from their home base in Florida especially for the Show for their first west coast perfomance of their critically acclaimed new first album "Decissions" with their songs also featured on the sound tracks of 2 hot new movies "Lizzie McGuire" and "How to Loose a Guy in 10 Days." Also performing live both days was LA's hottest blues band, 2000lbs of Blues. While in the parking lot next to the Show was this year's featured round of the SB2 Supermoto Nationals sponsored by RussBrown.com featuring America's top motocross and roadrace stars including Jeremy McGrath, Jeff Ward, Travis Pastrana, Mike Metzger, Danny LaPorte and others banging handlebars on an exciting motocross style course of asphalt and dirt. Needless to say, fans got a day stuffed full of exciting entertainment and activities and more than their money's worth. Mike Metzger (Hon) won the 14-minutes plus 2-laps Open Extreme Final, with Steve Drew (Hon) finishing second and Matt Pursley (Yam) finishing third. Jeff Ward (Hon) won the 450X Final, which went the same distance, Metzger second, and Mark Avard on the FastDates.com sponsored Corona Suzuki taking third. Team FMF Supermoto racer and manager, former World and National Motocross Champion Danny LaPorte hangs with the Beu Sisters and FastDates.com Calendar girl Chandi Mason in the Bike Show Supermoto pits. Also included in the incredibly low $20 admission price for the Show was free general admission to the historic Queen Mary ocean liner, normally a separate $23 admission charge to visitors. Plus on Saturday night Bike Show attendees were treated to a free party in the Queen Mary’s Observation Room Bar hosted by Keith Ball’s BikerNet.com . Another exciting new addition to the Show this year was the Iron Works magazine Reader's Olive Crest Saturday Charity Ride. Benefiting Southern California's largest children's home and family shelter, with over 150 riders assembling at the Olive Crest corporate home in Santa Ana on Saturday morning, were they were treated to complimentary lunch by McDonald's, then they rode their bikes in convoy to the Show were they were treated to VIP front gate parking. In all, ride participants were received some $120 in value including all weekend Show admission for their one low $35 charity donation to the great family services provided by Olive Crest. Additionally, 30 orphaned children from Olive Crest were honored as guests at the Show on Saturday and were treated to an extensive guided tour on the historic Queen Mary ocean liner. All the kids said they had an incredible time. Needless to say the highly successful Iron Works Olive Crest Charity Ride will become a regularly featured addition to the annual LA Calendar Show. And of course, the Show marked the premier of the new 2004 FastDates.com Calendars sponsored by Performance Machine, Mikuni Carburetors, Corona Suzuki, MotoWheels.com with the beautiful FastDates.com Calendar girls on hand both days to meet their fans, sign autographs, pose for photos and assist with trophy presentations. The calendar models included Miss Great Britain 2003 and SBK World Superbike / FastDates.com / Team Ducati Corse girl -Nicki Lane, plus Chandi Mason. And adding to the popular pinup theme of the Show both days was the Calendar Girl Pageant sponsored by the FastDates.com Calendars which drew many more beautiful girls to the event. The Show's on-stage activities were hosted throughout the weekend by Miss Los Angeles Ashley Esqueda, last year's Model Pageant winner and a recent finalist on ABC TV's All American Girl. This year's FastDates.com Calendar Model Search Pageant winner was beautiful Anel Rossouw from Costa Mesa, CA. 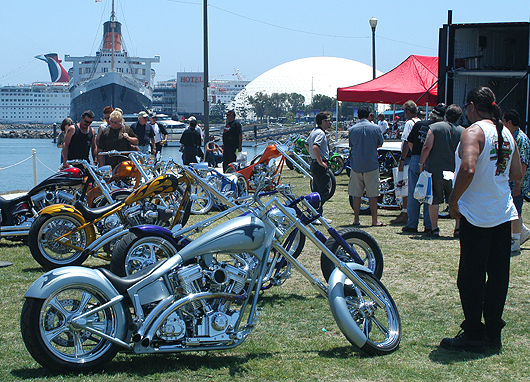 The LA Calendar Motorcycle Show again played host on Sunday to America’s premier Custom Bike Contest. Ted Sands from Performance Machine assisted with trophy presentations at the end of the day which featured some $50,000 in gift awards and the Show's renown working Mikuni Carburetor trophies. The coveted Performance Machine Best of Show Trophy (this year featuring a PM polished aluminum drive belt wheel on a base plaque) again at this year's Los Angeles Calendar Motorcycle Show to went to America's hottest new builder Jessie Rooke for his radical new hardtail bike "Rockett" styled after a classic 50's bicycle and featuring his now trademark "Single Sided" suspension. Radical design innovations on Jesse's winning custom included an under-the-seat gas tank to maintain the retro bicycle look of the machine, an oil tank hidden in the swingarm, and a retro style bicycle front fork spring. Jessie built the innovative bike from scratch in just 6 weeks before the Show, working non stop day and night in an all-out attempt to retain his title as America's premier builder at America's premier custom bike Show. Ted Sands (left) awards the coveted Performance Machine Best of Show Trophy again at this year's Los Angeles Calendar Motorcycle Show to America's hottest new builder Jessie Rooke for his radical new hardtail bike "Rockett" styled after a classic 50's bicycle and featuring his now trademark "Single Sided" suspension. Jessie is flanked by FastDates.com Calendar girls Chandi Mason and Miss Great Britain Nicki Lane, together with Show MC Ashley Esqueda. “We are extremely happy the 2-day LA Calendar Bike Show continues to be such a huge success," said Show producer and FastDates.com publisher Jim Gianatsis. " Response from Spectators and Exhibitors is nothing but positive,with the sold out parking being our only glitch. The Supermoto Nationals proved to be a great added attraction for the spectators, but it hurt us as well in taking up valuable parking space for many fans who had to park off site in downtown Long Beach. For next year we will look to possibly moving the Supermoto race to its own stand alone event weekend specifically for sportbike and dirtbike fans. This will free up more on site parking for the sell-out attendance we've experienced this year and last. The 2004 edition LA Calendar Motorcycle Show returns the weekend of July 17-18th, 2004, with complete details and pictures of both this year’s and next year’s LA Calendar Bike Show on this website. See you there! Gianatsis Design is a full service advertising, graphic design and photography agnecy serving the motorsports and sports fashion markets. Please consider Gianatsis Design for your advertising design and photography service needs. Click on our logo below to preview our work and client list. Congratulations on a great show! The bikes were great, the girls were beautiful, and it was just another excellent weekend. Performance Machine was excited to be an important part of it again this year and for the future! All of us from Iron Works had a great time at the Calendar Show and I just wanted to thank you and tell you so. We all agreed that the show was very well run and everyone was so accommodating. That has not necessarily been the case with all the shows we attend. We especially appreciate your wonderful promotion of the show - keep us tuned into how we can help with promoting future Calendar Shows in IronWorks, say by featuring a bike from the '04 calendar, as you and Dain may have already discussed. We're looking forward to next year. Congrats for a job well done! A heartfelt thanks for your taking such good care of us at the Calendar Show! Our location was great, the attention to our well being was awesome, and the Show was by all measures, a huge success. Thank you so much for making the extra effort at the 11th hour to see that we were able to participate!